are part of an aggressive series of audio amplifiers that provide boat rockin, ground shakin, crisp, clean bass for your marine audio system. 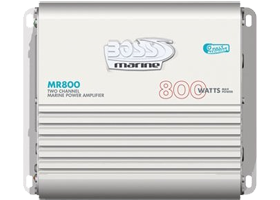 These finest selection of marine amplifiers will definitely get your audio systems perform at its maximum potential. Designed for the harshest marine environment, protective coating to prevent corrosion and ensures durability. With its classy look and sound enhancing technology, this is the perfect solution to your sound system!